This may be the easiest seitan you ever make. It goes through two baking cycles in your air fryer. After the rest, it’s still a bit wet and easy to cut into strips. The second cook makes them nice and chewy. Air Fryer Seitan is the best! How is Air Fried Seitan Different From Any Other? I love making seitan in my air fryer. 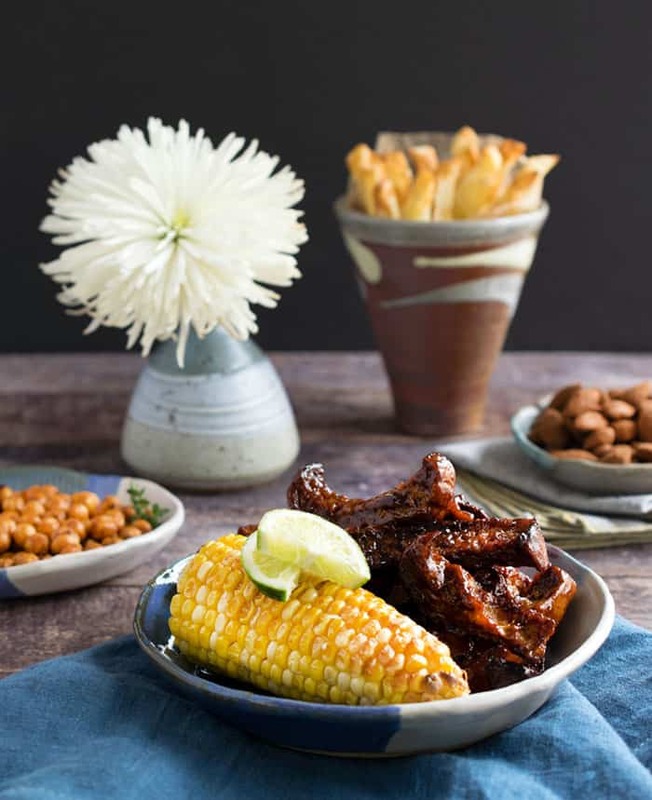 It’s a different texture than steamed and is perfect for these double baked Easy Air Fryer Seitan Vegan Riblets from my vegan air fryer cookbook, Vegan Cooking in Your Air Fryer. 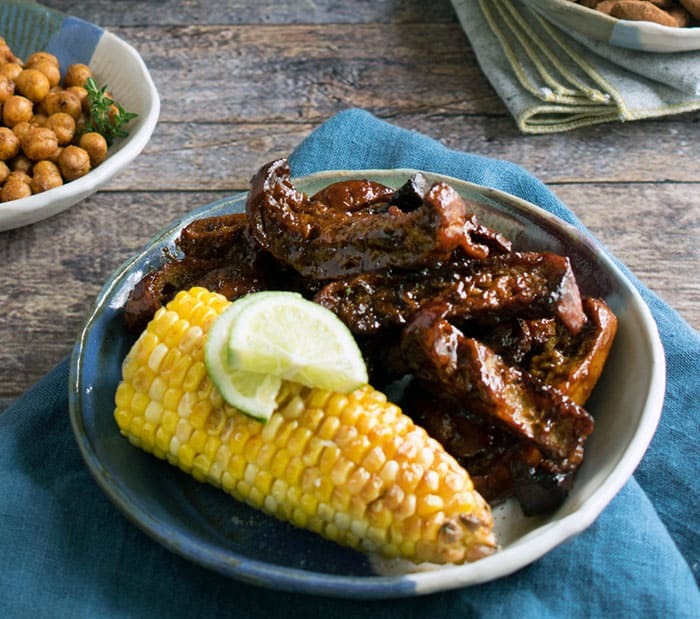 How Do You Make Seitan in Your Air Fryer? First you mix the seitan together in your food processor, then you press it into a shape and size that fits into your air fryer. Cut it in half so it will cook faster. Then cook those pieces in your air fryer until they get puffy. And believe me, they are gonna to puff up more than you can imagine! 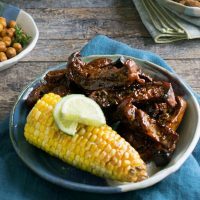 How Do I Make Seitan into Vegan Riblets in my Air Fryer? Then we take those large pieces out and let cool for a bit. Then slice 1/2 inch riblets from both pieces, toss with your BBQ sauce and cook for the last time. Don’t worry if there are parts that are thinner than others or pieces with some holes. I promise you it will make an out of this world texture! I have a video where I make these above, near the top of the post below the first image and text. It really helps you see the process and how easy it really is! New Vegan Tip: Be sure to look at the ingredients on bbq sauces, many have anchovies in them, sometimes in the form of Worcestershire sauce. This may be the easiest seitan you ever make. It goes through two baking cycles. After the rest, it’s still a bit wet and easy to cut into strips. The second cook makes them nice and chewy. 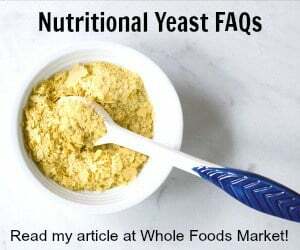 Add the vital wheat gluten, nutritional yeast, mushroom powder (or vegan Worcestershire sauce), onion powder, salt and garlic powder to your food processor. Pulse until mixed well. Let the our settle, then drizzle the water in through the top opening while you have the processor on. Then let the food processor run for about 3 minutes more to knead the seitan. Remove the dough and put it on a cutting board and knead a little bit more with your hands. Press and pull the dough into a circle or square shape that will fitt into your air fryer basket. Then cut it in half so that it will cook a little faster and more evenly. Place the 2 seitan pieces into your air fryer and cook on 370°F (188°C) for 8 minutes. Then flip the pieces over and cook 5 minutes more. You could stop here and cut into chunks to use in stir-fries, slice thin for sandwiches or cut into pieces and pulse in your food processor to make ground seitan for tacos or spaghetti sauce. Or go ahead and make riblets! Slice half of the seitan into 1⁄2-inch (12-mm) wide strips, then toss with about 1⁄4 cup (60 ml) of your favorite BBQ sauce. Place in an oven-safe container that fits into your air fryer and cook at 370°F (188°C) for 5 minutes. No mushroom powder? Use vegan Worcestershire sauce instead! 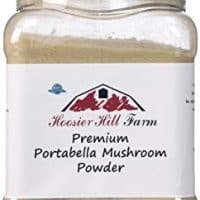 Hoosier Hill Farm Portabella Mushroom Powder, 6 oz. Oh my gosh, what a brilliant idea! I have got to make these! They are so good – I just ate some for lunch! These look AMAZING! I love how easy they make they are. I always think that seitan is going to be too much trouble, but it’s actually pretty easy! I feel the same way, but somehow not having to make a broth or simmer makes it easier in my mind too. 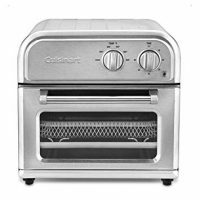 Can these be cooked in a regular or convection oven if no air fryer? Yes. I would cook on 375 and you may have to add extra cooking time. thanks, Kathy — can hardly wait to try these! First it was seitan in a bread machine … now seitan in an airfryer. This is definitely a game changer, thank you! 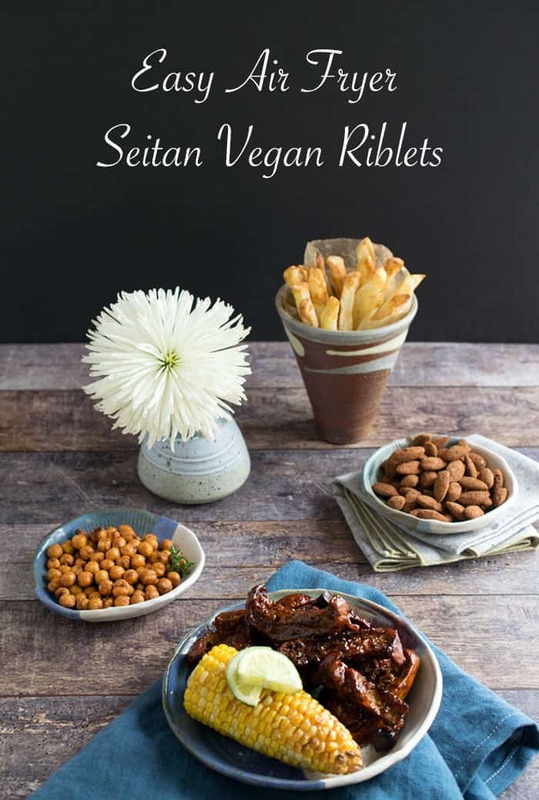 I have tried MANY seitan rib recipes and these are by far the BEST!! Thank you! Thank you – I’m so glad you like them! Does the seitan grow a lot in the air fryer? I burned out a toaster oven once because my little seitan steaks inflated so much during cooking they touched the top elements, don’t want to repeat that expensive mistake! It does grow some, but it hasn’t touched the top coil of my air fryer. I would just check it more often if you’re worried. oh my gosh, this looks so easy! i’m getting an air fryer this weekend! 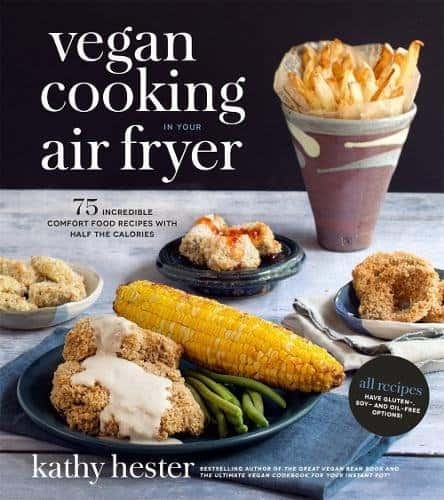 What Air Fryer(s) do you recommend, Kathy? I followed the recipe and used chik pea powder and it came out looking like bread… do you know how I can fix it for next time? If you substituted chickpea flour in place of the vital wheat gluten the recipe will not turn out. It’s in the post under the first pic and paragraph. It may be be taking longer to load. Are you on a phone or computer? Can’t find the video either. The “first pic and paragraph” only has a link to the book on Amazon. If I don’t have any mushroom powder, can I substitute mushroom broth for the water? 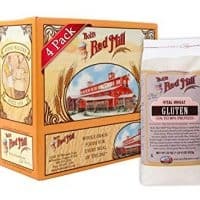 Kathy can you use anything in place of the vital wheat gluten- I don’t do gluten? I can’t do gluten anymore either, but I don’t think there is a one to one sub for this recipe. I am experimenting with some gluten-free vegan meat subs though. WOW. I grew up in TX and know from bbq ribs, though I’ve been a vegetarian since 1993. These are great! I was unsure of the holes and texture, but these came out terrific! Thank you!